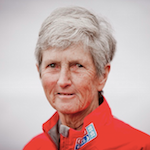 Track Linda’s ClipperTelemed+ boat and the rest of the fleet with the Race Viewer, which is updated hourly. Which boat is Linda’s? Which color? Cheers, Linda! Keep up the pace! God Speed! Had lunch with Martha & Tim and they told us about your adventure! We’ll be following and know you’re in our prayers! Linda, your kids at Camp Red Wing would be so proud of you for doing this long journey. The UT win over Oklahoma was priceless. The leaves here in NC are fantastic, and I know you are having the lime of your life. Sail on, my friend. Barb H.
Fascinating! I know it’s hard to find time to bring us along with you, but it’s so appreciated. What an adventure.